The first documented mention of the castle dates to the 14th century with a mention of Antoine de Nanton, who was from a Mâcon family. By the end of the 16th century, Philiberte de Feurs, the widow of François de Nanton remarried into the de la Baume family. This family kept ownership of the estate until the end of the Ancien Régime. During the French Revolution, the castle was partially destroyed and its valuables looted. In 1856 restoration was begun and the last of the castle’s fortifications were taken down. The Château de Nobles is a bed and breakfast inn and not a full-service hotel. Your hosts will be happy to recommend restaurants in the area for you. The property is a working vineyard. Be sure to try out the château’s wine! From the A6 at Tournus, go west 14.5 km. on D14 to Brancion. The château is one km. from the village. Nearest train station is at Tournus. The Château de Nobles is a wonderful place. Bertrand and Françoise de Chérisey have opened their castle, which is part of a family-owned vineyard, to those visitors who desire a charming, idyllic spot to hide away. The three large guest rooms are located in a wing off the main house, but in no way does this detract from the castle experience. Each room has a private entrance, with interiors featuring heavy wooden beamed ceilings, white-washed walls, stone fireplaces, and tile floors. Bathrooms are modern. One room has five single beds, making it ideal for families. 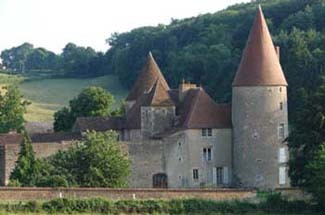 The castle is well located for touring the southern Burgundy region, or perhaps even a stopover on the way to and from the south of France. It’s a perfect place to relax for a few days. The castle is listed as a monument historique.